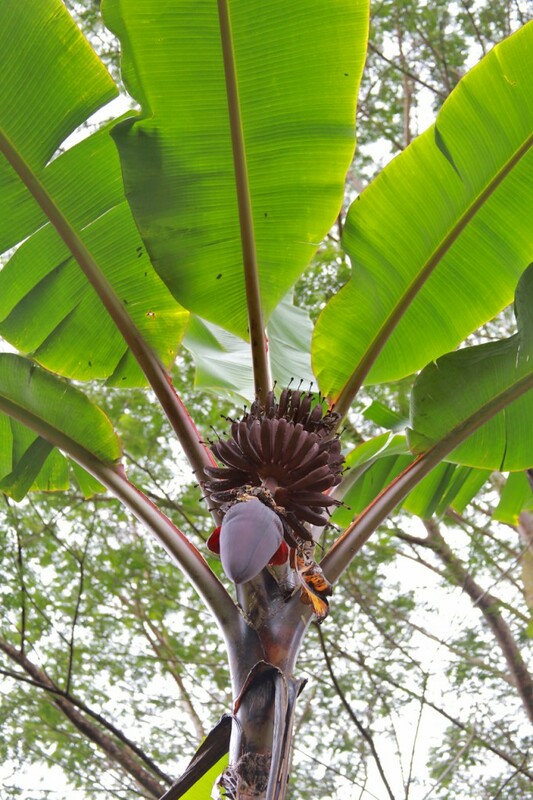 Home / More / Library / List of Medicinal Plants / Musa spp. 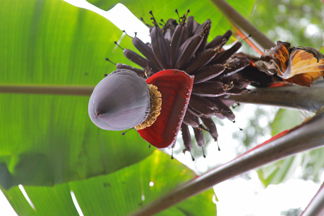 SIMILARLY USED SPECIES:Ensete glaucum, Musa paradisica, M. rubra, M. balbisiana, M. basjoo, M. coccinea, M. uranoscopos, M. fehi, M. lasiocarpa, M. nana, M. cavendishii, M. sinensis, M. sapientum, M. troglodytarum, M. wilsonii, Musella lasiocarpa. 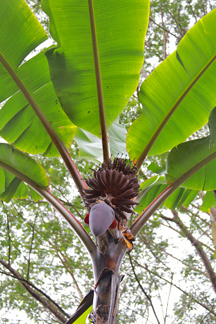 COMMON NAMES: Mai’a [Hawai’i], banana, plantain [English]; ba jiao, gan jiao, xiang jiao, ba jiao gen (stump), kanlu (nectar), jiao yu (sap) [China]; guineo [Spanish], box haaz, mopan [Maya]; jaina [Fiji]; kera [Nepal]; mei’a [Tahiti]; meika [Cook Islands]; fa’i, soa’a [Samoa]; kadali [India]. CATEGORY: Clear heat and poisons~. PROPERTIES: Very cooling (fruit) [China]. Sap is cold~. PREPARATION OF MEDICINE: Sap can be removed from the leaf (stronger) or from the trunk (milder), gathered in a container and refrigerated for future use. Fruit may be eaten raw or baked. 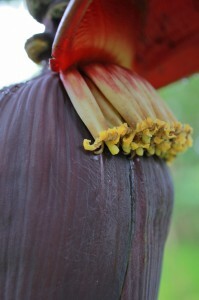 Flower can be cut into sections and prepared for various ailments. WESTERN FUNCTIONS REPORTED:Alterative (root); anodyne [China]; antacid [China]; anthelmintic (root); antibilious (root); antidiabetic (root); antifebrile (root internal) [China]; antifl atulent (powdered green fruits); antiscorbutic (root); aphrodisiac [China]; astringent (powdered green fruits); astringent (unripe fruit) [China]; bacteriostat [China]; carminative; cicatrizant; demulcent; dentifrice; depurative; diaphoretic; diuretic (leaves; stem juiced); emollient; febrifuge; fungicide; hemostat; hypoglycemic (fl ower); intoxicant (when properly prepared); laxative (ripe fruit) [China, Nepal, Universal]; refrigerant; restorative (root internal) [China]; sialagogue; styptic (root); vermifuge (human and animal use). Relieves thirst, moistens the lungs. Purifies” the blood and heals wounds. Relieves thirst and moistens the lungs (raw fruit). Stabilizes and binds (unripe fruit). Invigorates blood and tonifi es the jing. Invigorates blood (steamed fruit, fl ower). Tonifi es the jing essence (steamed fruit). Promotes bowel movement (ripe fruit). Reduces heat, cools the blood and clears toxins. TOXICITY:None noted. There are reports of the stem juice used as arrow poison in Africa and Tahiti. CAUTIONS AND CONTRAINDICATIONS: The sap stains (just TRY getting it off your clothes). When used topically on infected sores, the wound must be cleaned well to prevent the healing of the skin over the infection. ENERGETIC CAUTIONS: Fruit should not be eaten in excess [China].